Let's say, hypothetically, that your latest project has just crashed in flames because your boss forgot to sign off on the extension for the 15 contractors who were staffing it, and they got reassigned. You can get them back in three weeks, but you'll never meet the deadline now. You've just about had it, and you've decided that your boss is totally incompetent. 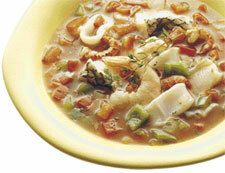 Seafood stew. Photo courtesy U.S. National Diabetes Education Program of the US National Institues of Health. All you really know is that your boss's performance has been pretty dismal. Incompetence is just one possible explanation. For instance, your boss might be distracted by problems at home — a sick parent or child, a death, a troubled marriage, substance abuse, or identity theft, to name just a few possibilities. As subordinates, we rarely have enough data to support any diagnosis of the causes of our bosses' poor performance. Without such data, attributing the cause of the problem to someone's character or lack of talent could be an example of a common mistake called the Fundamental Attribution Error. A more constructive approach focuses on dealing with the consequences of your boss's performance. Here are some insights and steps you can take that might make your life better despite the situation. Some very popular but ineffective tactics include stewing about the situation, griping with co-workers, or carrying the problem home to those you love. While these choices provide emotional support, they aren't likely to solve the problem. Search for something that can lead to a positive outcome. Probably you've encountered substandard performance elsewhere in the organization, but it didn't bother you because you were less directly affected. Since you'll probably bump into substandard performance again, transferring to some other part of the organization is a questionable strategy. If you're considering a move, make a decision. Move or don't move, but make a decision. Sometimes decisions are difficult. Figure out how much time you need. Delaying beyond that is probably a symptom of avoidance rather than evidence of difficulty. If you decide to leave, make leaving a priority. Conduct a disciplined job search, the way you would if you lost your job. If you decide to stay, commit to staying. Formulate strategies and tactics for safeguarding your career and maintaining your happiness despite your boss's performance. When you estimate effort and duration for task assignments, allow for your boss's performance. Scale back expectations of the capability you can deliver. You can avoid frustration by anticipating trouble. To some this will feel like giving up, but it's just accepting Reality. Manage the risk. For more on distinguishing which issues are yours and which issues belong to others, see "Stay in Your Own Hula Hoop," Point Lookout for June 27, 2001. Would you like to see your comments posted here? rbrenshOxSVjMXJqCZrqOner@ChacfojEfDxgCYTYWvHQoCanyon.comSend me your comments by email, or by Web form. I offer email and telephone coaching at both corporate and individual rates. Contact Rick for details at rbrenBEwjbkoFttdAhCkaner@ChacoYBYbihYUjiJITzCoCanyon.com or (650) 787-6475, or toll-free in the continental US at (866) 378-5470.